Ken loves the movies, both watching and performing in them on screen. He has always been fascinated by the imaginary world and situations shown on film. Being one of the imaginary characters in a film is electrifying to Ken. 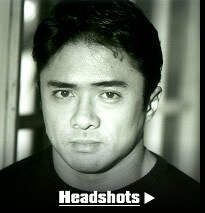 As a martial artist in his early 20s, he began his film adventure as a stunt fighter. He was one of a few martial artists who could do flips and fall on the concrete without mats and any protection. That gave him the opportunity to begin his film journey. 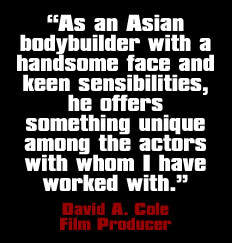 As he pursued his legendary status in pro bodybuilding, he also appeared in films not as just a stunt fighter, but also as an actor.Some people began to call him the “Japanese Arnold Schwarzenegger,” whom Ken respects for his dedication and hard work to achieve an American dream. As his belief inbalanced skills of sports, academics and arts, he studied theater and mime at University of Southern California and Pomona College in addition to the extensive voice and body work taught by the master, Arthur Lessac. Most recently, Ken has appeared in the film, “Just Another Romantic Wrestling Comedy” as one of the leads, in which some of his friends, Chyna (former WWE superstar) and Don “The Predator” Frye (UFC Champion), also flexed their biceps. In the film, he was a pro-wrestling super star who continuously gets dumped by his true love. 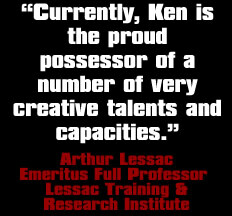 Ken has appeared in other films such as: Double Dragon, Red Sun Rising, Galaxis, and more. In many of the films, he has been shown as a tough martial artist. The recent wrestling film definitely shows more characters of Ken as a lover, player and tough guy! Many of his fans would like to see him play a superhero or warrior characters as his personality and belief naturally match them. Other film projects Ken has been involved in are on the way. We just never know what he will do next on the silver screen! The American Muscle on ESPN2 named Ken Yasuda, The Samurai Warrior, when he debuted with a samurai sword with a warrior outfit in the world of professional bodybuilding championships in 2000. His popularity instantly catapulted and led him to be a regular on the show and commercials internationally. Unlike the typical bodybuilding poses, he incorporated a posing routine with his martial arts skills. This proved to show that he is a true athlete and performer himself. As his popularity increased, many industry magazines such as Ironman, MuscleMag, Muscle & Fitness, etc, began to write articles on and show pictures of him. This Samurai Warrior character on ESPN2 attracted more attention from several business entities. Some of them include TV commercials, like; Powerhouse Gym, Sweet Dream, American Muscle, etc. His TV appearances has not only been from his pro bodybuilding career, but also mixed martial arts (MMA) as well. 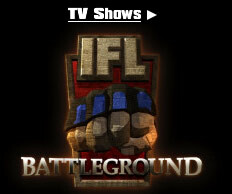 As the headcoach of The Sabres in the International Fight League on Mynetwork TV (FOX), he became a regular on the show, Battle Ground (Monday nights at 8pm). As the headcoach of the undefeated team in the regular season, he has appeared on the Best Damn Sports Show with Bas Rutten, who is a long time friend. Mynetwork TV also he was in several commercials for the Battle Ground by appearing in promos nationwide. NBC sports news and morning shows also had Ken as a guest to talk about the MMA and his team. It seems that the combination of his confidence and unique accent was appealing to many of the fans and viewers and Ken was easily remembered and identified. In his early career after taking the Mr. Japan Title, he has appeared in numerous Japanese TV game shows as a special guest. He was also a regular on a talk show, Gate of Pro-Wrestling on Samurai TV in Japan for 6 months. His looks and “Japan - English” received a lot of attention from the viewers. In some other shows, he was a martial arts master teaching popular singers how to incorporate martial arts with dancing. In other shows, he was a macho man, who was considered to star in the Japanese version of Konan, Superman, etc.